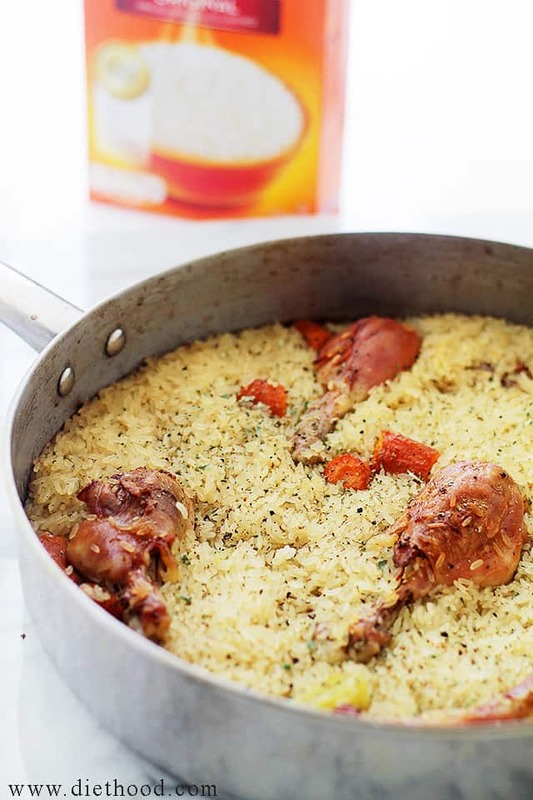 Chicken and Rice Casserole: Moist and tender chicken pieces nestled on a bed of delicious baked rice. There is a question that I am often asked by many of my readers, as well as friends and strangers; why did you start a food blog? I grew up watching my Mom prepare beautiful, super delicious dinners, day after day. She worked 7 to 3, but she always managed to have a home cooked meal for us. No matter how tired or busy she was, she was never too busy to feed us amazing meals. I also remember her baking elegant desserts, scrumptious cakes, and fresh bread! Superwoman? Possibly. What I’m mostly thankful for, though, is that she always allowed my sister and I to partake in the kitchen. Whether it was holding the wooden spoon and pretending to season the veggies, or holding her hand while she held the mixer, we were always involved. Also? I LOVED washing the dishes. I was 6 years old and my favorite task was to wash dishes! So weird. And awesome! I dislike it now, but back then it was FUN! But, my mom’s strategy paid off. I completely agree with the above. I have never had a Big Mac, I don’t know where Wendy’s is, and no matter how much butter or pasta I eat, I am still considered “skinny”, and have very healthy eating habits. Just ask my family and friends! Because I want my children to feel as lucky as I do, they are almost always involved in the cooking and baking process. Honestly? Just washing the vegetables keeps them happy! But, when I let Ana stir the rice into the water?? Oh, that is a time to celebrate! When Uncle Ben’s asked me to promote their Uncle Ben’s Beginners program, I had to accept. I think it is extremely important to cook with your kids to not only spend time together, but to also teach them about good food choices. 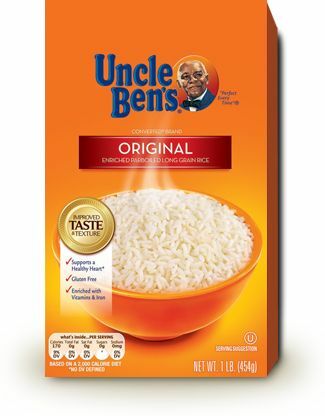 The Ben’s Beginners Cooking Contest is a nationwide cooking video competition for kids that brings families together to cook a healthy rice based meal. 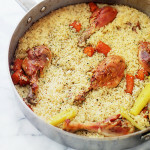 One of my kid’s favorite meals that includes rice is this Chicken and Rice Casserole. It’s easy, it’s quick, straight forward, and they absolutely love it! Gather your kids, find your camera, and make this casserole, together. Then, you can submit your video to The Ben’s Beginners Cooking Contest and you might win $15,000 for your family and a $30,000 cafeteria makeover for your school!! I promise the experience will be fun and not at all scary! ENJOY! 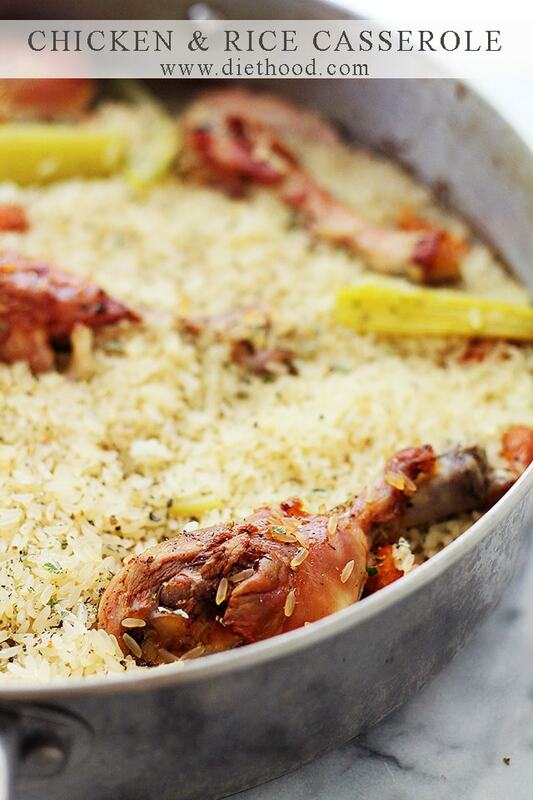 Moist and tender chicken pieces nestled on a bed of delicious baked rice. Place chicken pieces in a large pot and cover with 6 cups water; bring to a boil. Using a large spoon, remove white foam from top of water. Add sliced onions, celery pieces, and carrots; cover the pot, lower to medium-low heat and cook for 30 minutes. Spread uncooked rice on the bottom of a baking dish. You will need a baking dish that is stovetop-safe. Remove chicken pieces from broth and place on top of rice. Pour the broth into the baking dish with the rice and chicken. Depending on how much water was reduced while making the broth, you may need to add up to 1/2-cup more rice. Place dish over medium-high heat. Remove from stovetop and place in oven; bake for 15 to 20 minutes, or until all liquid is absorbed. This looks great! One question: can I freeze portions to be eaten later? This is what I call comfort food! What a great meal! Talk about comforting dishes!! I’m in love with all this fall weather coming on so quick! 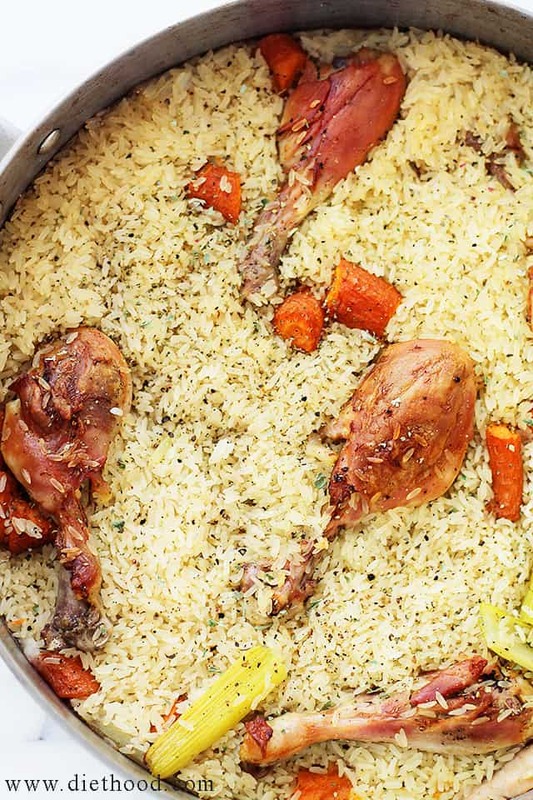 Chicken, rice, roasted vegetables … comfort food at its best. I love it. WHOA BABY!! Now this is what I want for dinner! This recipe looks unbelievable. You make such wonderful dinner recipes! I love a meal that has the main protein and side dish all in ONE POT. This sounds quick, easy and get-in-mah-belly delicious!